Cater Motor Co Ltd of Bristol, part of Henlys Ltd.
Homepage. 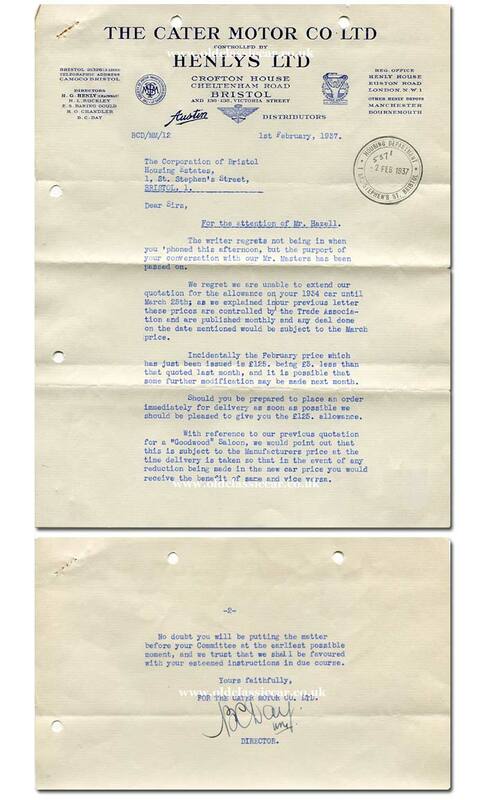 This page: News regarding the purchase of a new Austin Goodwood motor-car, in 1937. In early 1937, the housing department within Bristol Corporation were looking to part-exchange a car for a brand new Austin Goodwood, a popular four-door saloon of the day. This letter, dating to 1st February and issued by The Cater Motor Company - a Bristol-based distributor of Austin cars - refers to this proposed deal. The Corporation were looking to trade in an un-named car, built in 1934, for a new Austin, and clearly there were discussions regarding the older car's likely value. The Cater Motor Company's main offices were situated at Crofton House, on Cheltenham Road in Bristol, and also at 136-138 Victoria Street. The company directors were listed as H.G. Henly (Chairman), H.L. Buckley, F.S. Baring Gould, R.G. Chandler, and B.C. Day. The latter's signature can be found on the second page of this correspondence. Henlys Ltd, the parent company, were a large company based in London, with subsidiary branches in Manchester and Bournemouth. The embossed letterhead incorporates a pair of Austin car logos, and also those of The Society of Motor Manufacturers & Traders, and the Motor Trade Association. The Cater Motor Company Limited was established at Crofton House in Bristol by Howard Alexander, George Chappell and Frederick Cater, in 1923. It continued in business throughout the 1920s, before being taken over by Henlys in 1928. Trading in motor-cars continued under the new ownership, with the garage being significantly expanded into further new buildings, in the 1950s. But what of Crofton House, and the dealership on Victoria Street? A great photograph of the latter premises turned up on Flickr during a search (image link). Note the signage, no mention of The Cater Motor Company, just of "Henlys - Englands Leading Motor Agents (Austin Distributors)". A number of cars produced by other manufacturers are in shot including, on the left, a Cowley from arch rivals Morris. In 2006, a planning application was submitted to re-develop the Cheltenham Road site, but retaining & converting Crofton House (also referred to as the White House). By 2008 the new housing, and the conversion of the former Cater Motor Company's home, was complete. Garage buildings erected in the 1950s were lost during the work. Return to the Motoring Collectables section, where many other items relating to the motor trade may be found.